Taxi is probably the most conveient form of transport, it cost around S$20 (50% more of the metered rate if travel between midnight to 6am) from the airport to the hotel in the city. The MRT is located at Terminal 2 and cost around S$2 to travel from the airport to the city. Tourists arrive in Terminal 1 and 3 can take the skytrain (free) to Terminal 2. There is a free shuttle bus from the Budget Terminal to ferry visitors to Terminal 2 as well. To find out more details or other modes of transport (e.g airport shuttle, Limousines) from the airport to the city, click here or toandfromtheairport.com. There is Free Shuttle Service available if you have more than 5 hours in transit, hop on the Free City Shuttle to the Singapore Flyer, Little India and Suntec City and get a taste of Singapore’s ethnic heritage, state-of-the-art attractions and thriving retail scene. Registration available at the Singapore Visitors Centre located at Terminal 2 & 3, Arrival Hall between 0600 hrs to 1845 hrs. 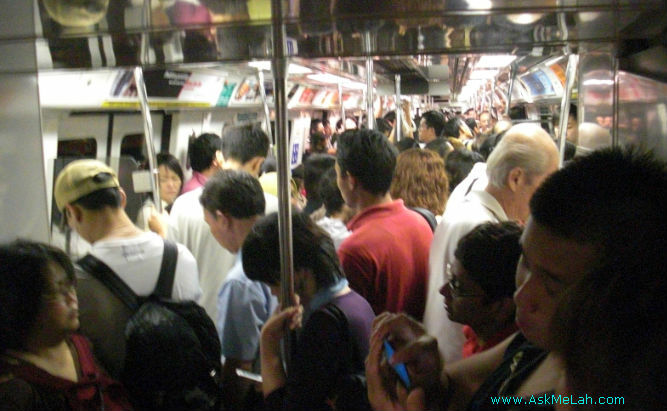 A typical crowded scene in busy MRT exchangesMRT is the acronynms for Mass Rapid Transit which is the equivalent of subway or metro in other countries. The MRT are reachable to most of the popular destinations for tourists E.g. Changi airport, Orchard Road, Chinatown, Little India, HabourFront (Sentosa) and City Hall. Singapore Zoo, Night Safari, Jurong Bird Park are not accessible via MRT. MRT fares ranges from S$1 to S$2, very afforable. Note that there is a S$1 deposit which can be refunded conveiently at the ticketing booth or the control station counter. Tourists can get the Singapre Tourism Pass at selected TransitLink Ticket Offices and Singapore Visitors Centres which costs just S$8 per day and comes with the option of a 1 -Day, 2 – Day or 3- Day Pass. The Pass, if issued in Singapore, comes with a rental deposit of S$10 which is fully refundable if the card is returned within 5 days of issuance. The MRT is packed most of the time, this picture was taken around 11am weekday on Dec 2009. The MRT operating hours is from 0600-2400 hour (click here for detailed timing), you can get a map of the MRT network here. In case you are curious, LRT (Light Rapid Transit) is the driverless above-ground railway that serves the residents within a suburban town (we called them HDB town), not likely to be used by tourists. In terms of social etiquette, we are in complete opposite of Japan, food and drinks are not allowed on train but talking on the phone is ok. Be warned that the MRT are packed at all hours especially on the North-South line, you can forget about getting a seat on the MRT. Some high ranking officials from STB and LTA should really look into this problem. The Singapore Tourist Pass comes in 3 options; 1-day, 2-day or 3-day passes. *Each pass is subjected to a $10 rental deposit which will be refunded if you return the card within 5 days after the day of purchase. *Each pass will allow for unlimited travel on basic bus services. It excludes rides on Premium bus services such as Express, Fast Forward, Night Rider, Nite Owl, Chinatown Direct, Jurong Island and Bus Plus services. ERP surcharge: this is equivalent to the toll charges in other countries, but Uniquely Singapore as it is a Singapore’s “invention” to control traffic flow into the Central Business District (CBD) and highways. It ranges from S$0.5 to S$4 depending on the time and the number of gantries you have crossed. Midnight surcharge: 50% surcharge over and above the meter rate, starting from 12am to 6am. As you can see, the charges are so complicated that even the locals are not very familiar with various surcharges. This has prompted the taxi companies and government to issue a clarification in year 2008. There were many disputes arised as some tourists thought that the taxi drivers were out to cheat them. This is really unfortunate as most taxi drivers are honest people. One thing to note is that taxis are very hard to get when it rains. It used to be hard as well to get one during peak hours but the situation has improved slightly with the introduction of Peak Hour surcharge since 2008. Be warned: Very slim chance at all for taxi bookings or hail cab from the street, if there is a heavy downpour or during peak hours (7-9am, 5-8pm). The centralised number to call for taxi booking is 6-3425-222 or tap out the alphabetical prompter 6-DIAL-CAB. Click here if you want to thank a job well done or lodge a complaint against the taxi driver. For the tech savvy, you can download the Cab@SG or Sg Taxi (Singapore Taxi Booking) for Android / iCab@SG for iphone smartphone users. both provide a one touch number for every Singapore Taxi operators’ booking numbers in one page. Not recommended for tourist. The cost is almost the same as MRT but the waiting time could be quite long during off peak hours and crowded during peak hours. If you really want to experience it, use Gothere.sg to plan your bus journey, available for online and mobile versions. The Google Map on android phones has improved a lot since, it could be a good alternative to gothere.sg. For bus arrival time, my personal favourite is SBS Next Bus which you can donwload it from Android market. There is no iphone version currently, the alternative is Singapore Next Bus for iphone users. How to get to KSL City by bus? Fancy driving around in Singapore. Our advise? Forget it. The local drivers are a bunch of aggressive drivers. Not only that they drive fast, they do not give way, do not stop upon seeing the STOP sign and beat the traffic lights. The ERP (Electronic Road Pricing), a local “invention” to manage traffic congestion, are everywhere in the central areas and some highways. If you are not familiar with the locations, it may cost you a lot especially if you are lost and will enter a number of ERPs. To use the ERP, you also need to buy a prepaid card known as CashCard which is not refundable. There is almost no free parking anywhere in the built up areas and the parking fee in CBD or Shopping areas in downtown can burn a big hole in your pocket. There are some areas in downtown and suburban towns where you may need paper parking coupons for street parking, much like the metered parking in US and Australia except that we do not have the meters here. Now you have been warned and still want to drive, my last advise is get a GPS navigator. The basic model can go as cheap as less than S$200. Else if you have a Window Mobile phone, you can buy the mobile application from MapKing for less than US$50. The car rental rate ranges from S$50 to S$200. You may get the online rate from Singapore Car Rental or Euro Auto Leasing. We recommend visitors to use Gothere.sg to plan your trip in Singapore. Gothere.sg provides various modes of transportation including bus, MRT, taxi and car. Not only that it provides the route, distance and approximate fare, it also estimates the time taken for each mode of transport. The simple and user-friendly interface is a hallmark of this website. Trust us, it is even more user friendly and more reliable than Google Map Singapore. For the tech savvy tourists, you may want to buy the mobile application to help you to navigate. If you have a Window Mobile phone, you can buy the mobile application from MapKing for less than US$50. If you have a Nokia phone, try this. For smartphone users, NavFone (free for Samsung phones), Streetdirectory(free), MapKing and Google Map (free) are good alternatives. Many local apps have been developed for the iphone and android platform. Just type keywords such as Singapore Bus or Singapore MRT and you will likely to find many apps available in iTunes and Android Markets.